Connect Amazon Fire TV Stick to your HDTV and start streaming movies, TV shows and songs from Amazon Prime Video, Hotstar, Netflix, Gaana and many more services. Subscription fees may apply. Easy to setup and use: Pre-registered to your Amazon account so you can just plug it in to your HDTV and enjoy favourite titles and personalized recommendations. Massive Selection: Get access to thousands of Bollywood, Hollywood and Regional language movies and TV episodes, songs and games. Perfect with Amazon Prime: Amazon Prime members get unlimited access to Amazon Prime Video, featuring thousands of Bollywood and regional blockbusters, Hollywood movies, US TV shows, award winning Amazon Originals and kids' shows at no additional cost. 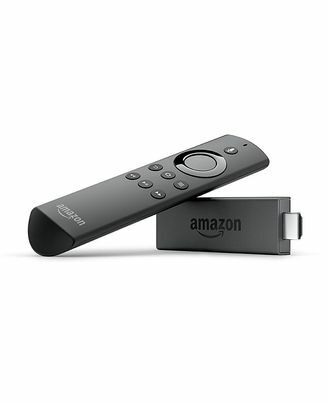 Voice Search that really works: Amazon Fire TV Stick comes with a voice remote. Simply press the voice button and say the name of the Amazon Prime Video title you want to watch and start enjoying in seconds. Take your TV with you: Bring your favourite shows and movies with you when you travel. Plug Fire TV stick into any TV's HDMI port, connect to Wi-Fi and continue watching. Some content not available in all countries.